Is there any way to make peas taste better? Just like bacon, pancetta makes everything taste better. Pancetta is like an Italian bacon made from the pork belly meat, and is salt cured. Sometimes it is sliced very thin, or more likely, found diced in small cubes. You can find it in the deli of your grocery store, usually around the area where the gourmet cheese is. I found this recipe in a Penzey's Spice magazine several years ago. If you are near a Penzey's Spices store, GO! The spices are amazing. They have jars of every single spice so you get to smell each one. I also try to avoid cooking with salt as much as I can. Penzey's has a whole sheet of their own spice blends that are salt free! They are amazing! If you get a chance, I encourage you to stop in and check out the store. This is a recipe I don't make too often, more when we are having a special dinner. Take a look. Heat olive oil in a large frying pan over medium heat. Add the pancetta and cook, stirring frequently until golden brown and the fat has rendered off, 15-20 minutes. Remove pancetta to drain on a paper-towel lined plate. If there is a more than about 1/4 cup of oil left in the pan, drain some off and discard. Add the shallots, crushed red peppers and thyme to the pan and cook until softened, stirring regularly, about 10 minutes. Add the peas and cook until just warmed through, 5-10 minutes. Stir gently every few minutes. Transfer to a serving bowl. Add the pancetta and stir to combine. This is definately not a hard recipe to make, but it's worth it. The best thing is that the pancetta comes already diced and ready to use. No prepping necessary. I can see substituting bacon if you can't find pancetta. But, then you have to go through the process of slicing and cooking the bacon. Pancetta is sooo much easier. I should know better than to do a blog post on a Wednesday night. It's Chicago night on NBC. Do you watch them? Chicago Med, Chicago Fire and Chicago PD. Chicago Fire is by far the absolute best. And tonight they are doing a cross over between Fire and PD. So, in otherwords, it's taking me twice as long to do this post. If I would have thought this through, I should have done this earlier in the day. Oh well. Next time. I love these calla lilies. One year I even planted some in this exact shade, but they never grew back the next year. I was so disappointed. Now, I can get them year round with this stamp set! For some reason, when I think of these calla lillies, I always think in a deep shade of pink. Lovely Lipstick comes to mind. Love how they pop against the black. They definately make a statement. I had to fussy cut the large lily and also the leaf. Good news is that starting in March, the framelits will be available for purchasing! No more fussy cutting. A little too late for this card, but it wasn't hard to cut out. It's hard to see, but I had another layer of Basic Black on the card base. 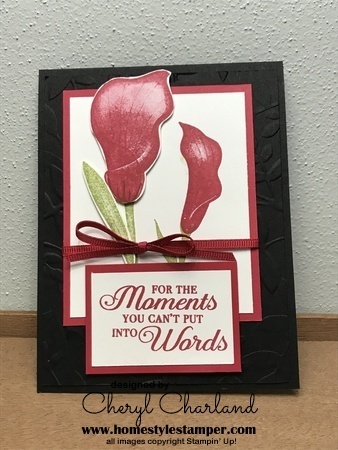 This layer I used with the Layered leaves Dynamic Embossing Folder. It added a little bit of texture because I thought the base was just a little too plain. Look at the inside of the card. Love how this turned out. 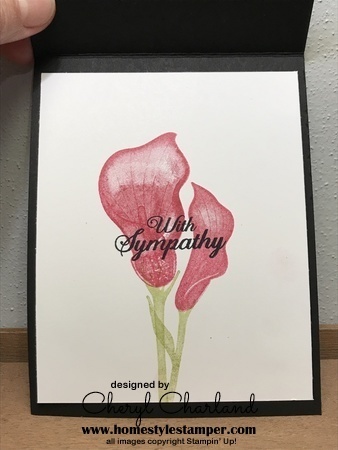 Stamp the lillies for the front of the card and then immediately on the inside piece. If you don't stamp off, the image will be too dark to actually write over. This card was a little putzy to put together, but in the end, it was worth it. It's almost to pretty for a sympathy card. Click on the above picture for dimensions and instructions.